Bochoř (Czech Republic) (AFP) - As global automakers compete to bring the first flying car to market, Czech pilot Pavel Brezina is trying a different tack: instead of creating a car that flies, he has made a "GyroDrive" -- a mini helicopter you can drive. The engineer and owner of Nirvana Systems, a company producing motors for small flying machines, insists his vehicle is the first in the world authorised to operate both on roads and in the air. "This is the only road certified flying vehicle I know about," Brezina told AFP in a hangar at the Prerov-Bochor airport in the eastern Czech Republic. "Everyone is trying to make a high-speed car that can fly, but this is a different thing," said the tall, bespectacled 51-year-old, who has 30 years' experience as a pilot under his belt. His GyroDrive vehicle is based on a gyroplane -- a mini-helicopter -- that uses a copter-style rotor to move up and down, and an aeroplane-type "pusher propeller" to go forward. 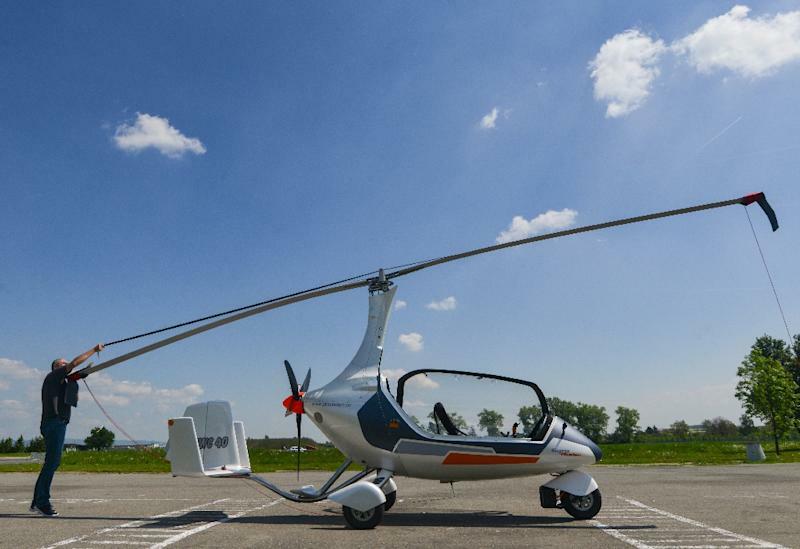 Brezina's company buys gyroplane kits from a German firm, and then assembles and equips them with a system allowing the pilot-driver to switch between a petrol engine propelling the rotors and an electric engine that drives the wheels. The two-seat GyroDrive has a maximum driving speed of just 40 kph (25 mph) and can take its crew of two on short drives to a petrol station or a hotel. It needs less than 100 metres (110 yars) to take off and reaches a top speed of 180 kph in the air. Its flying range is 600 kilometres. After landing, the pilot only has to fix the main rotor blades along the axis of the GyroDrive and pull out a built-in licence plate to transform it into a road vehicle. Prices start at 1.5 million koruna (57,000 euros, $63,500), but they can reach four million koruna, depending on specifications. While Brezina is already planning to take his wife -- also a pilot -- and two children to London aboard GyroDrives, inventors worldwide are frantically working on prototypes of cars that fly. In neighbouring Slovakia, the AeroMobil company says it has received dozens of orders from customers for a flying car expected to hit the market in 2020. "We want to build a vehicle that will not only be able to fly and drive but also fulfil each technical and legal requirement," says AeroMobil CEO Juraj Vaculik, touting "a robust testing programme". He told AFP that AeroMobil initially plans to produce 500 units of its winged car, which uses a turbo propeller to get off the ground. The AeroMobil is expected to reach a top ground speed of 160 kph and up to 360 kph in the air, with a flying and driving range of some 700 kilometres. In mid-May, Japan's Toyota also unveiled plans to launch a three-wheel flying car dubbed SkyDrive using retractable wings and drone technology. The vehicle is expected to have a top flight speed of around 100 kph, hovering around 10 metres off the ground. It will have a top land speed around 150 kph. Silicon Valley flying car startup, Kitty Hawk, reportedly backed by Google co-founder Larry Page, released a video in April of its airborne prototype and announced plans for deliveries of a "personal flying machine" this year. Other firms, including ride-sharing service Uber, also have soaring ambitions for their flying car prototypes. Brezina got the licence plates for his GyroDrive in March, three years after starting the project. For his first trip, he flew some 230 kilometres west to an airport on the outskirts of Prague, then drove downtown to have a cup of coffee in the Czech capital's central Wenceslas Square -- and got stopped by the police on the way. "Well, if you saw this driving through Prague, wouldn't you stop it? I would," chuckles Brezina, adding the police merely checked his papers and did a breathalyser test. Brezina told AFP he has already been safely flying gyroplanes all over Europe and beyond for the last seven years with a group of friends. "I would liken it to a group of motorbikers, this is actually a 3D motorbike. We also travel to other continents where we rent gyroplanes," he said. Looking into the future, Brezina said he doubts GyroDrive will take over roads and airways. "First, it requires a set of certain qualities to become a gyroplane pilot, and second, it's not just about pushing a button. I think it will spread, but not on a mass scale." Co-financed by the Slovak government, AeroMobil will not be everyone's flying car either because of its eyewatering price tag of 1.2-1.5 million euros ($1.35-1.7 million) per unit. It will rather serve as "some kind of a flying Uber service," Vaculik said. 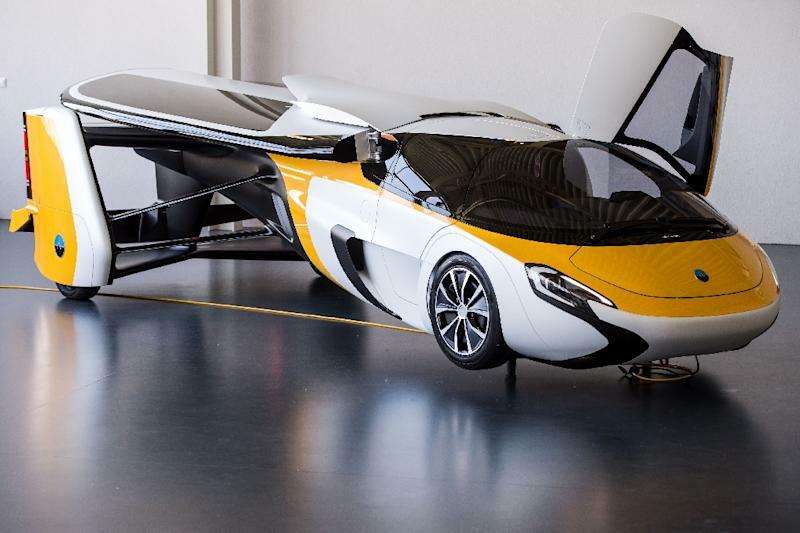 "Our concept is that not many people would own this flying car but many will be able to use it," he added.